Kids can learn so many valuable lessons about cooking through this recipe. They get exposed to a handful of different vegetables, and even a special starfruit that is sure to pique their curiosity. They also get to incorporate their art skills in trying to arrange colors and shapes to make a visual (you can learn more about art + food in this blog post). It's like an edible puzzle! This recipe can also be combined with a variety of dips that will add major flavor. We've got a great hummus recipe that you can check out right here. **Grown-up** Use chef knife to break apart head of broccoli into smaller sections for kids to easily tear apart. Save one of the stems (for the tree's trunk)! Tear broccoli into smaller florets. Rip off medium sized pieces of cauliflower. **Grown-up** Slice off a piece of starfruit as a topper to the tree. Use one of the bigger broccoli stem pieces to make the trunk of the tree and place at bottom of large serving plate. 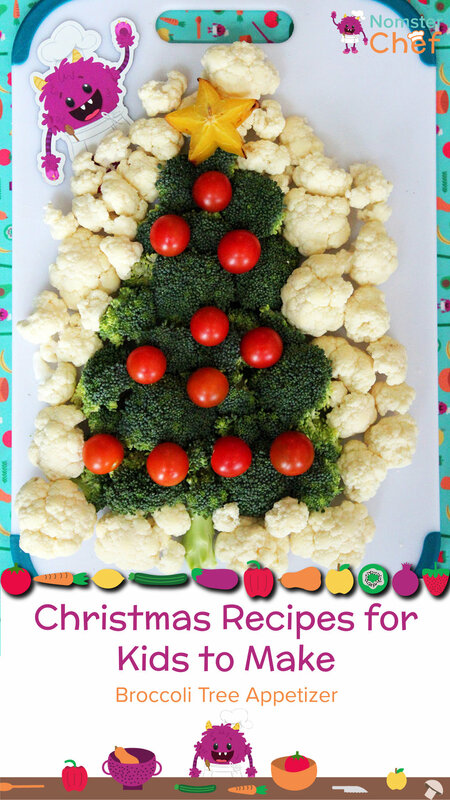 Build the Christmas tree by arranging broccoli florets in a triangle shape. Once the tree is made, place the cauliflower pieces around it to frame the tree and look like snow. Add grape tomatoes into the tree shape to look like ornaments. Place the star fruit on top of the tree. Bring to a party and Nom! 1. Starfruit can be tricky to find in grocery stores, but not impossible! Many grocery stores carry this special fruit this time of year, it may just be a little hidden in the produce section. Have your little ones help keep their eyes peeled in the store. No starfruit in sight? There are plenty of back-up plans. You can use a yellow bell pepper cut up into small triangles to make a tree topper instead. 2. When tearing apart the broccoli and cauliflower pieces, make sure to leave a base on the bottoms. This helps them stand up easily on the plate, making it a breeze to assemble your Broccoli Tree Appetizer. 3. Get creative with other vegetable ornaments! Since veggies come in so many shapes, sizes, and colors, there are endless possibilities for a decorated tree. The sky's the limit! 4. Looking for a homemade dip inspiration? Try our hummus recipe (another great, easy recipe for kid chefs). Plain greek yogurt mixed with spices or a dry soup mix (like veggie or onion) could be another easy dip idea.